UrbanEdge is a family of site furniture and framing elements designed by GGN for Landscape Forms. 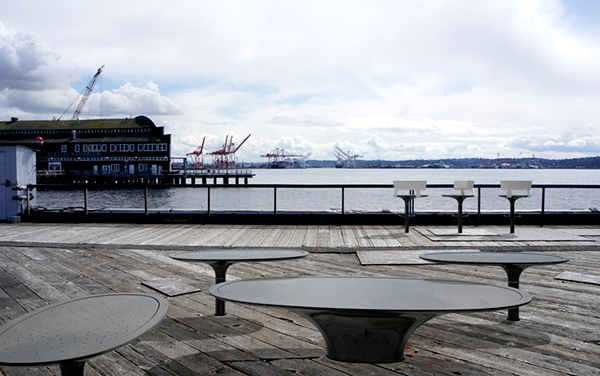 The furnishings respond to the demand for more outdoor public spaces with an interest in less formal, more welcoming and effective use of underutilized urban space. GGN took inspiration from social interactions that occur in different types of places – lunch rooms, living rooms, transit stops and playgrounds – and extracted their relaxed, informal spirit to design furniture elements that enliven their surroundings. The UrbanEdge furniture and framing elements are multifaceted and work together in various combinations to create unique yet functional sites. They define edges, activate corners, create niches and furnish lively outdoor settings with dynamic and kinetic furniture elements that suit the way we interact today. The UrbanEdge collection is produced by Landscape Forms, the world’s largest manufacturer of high-design site and streetscape furniture collections. UrbanEdge pairs GGN’s experience in designing urban spaces with Landscape Forms’ expertise in developing beautiful site furnishings that address issues in urban environments; built to perform and endure under conditions of high-usage.